This is a delightful read, granted being a liar is nothing but the lowest form of relationship problems to deal with. The liar is the dead husband of Shelby Pomeroy. And what a horrific way to find out he lied - about everything. He gave her all that money could buy and left on frequent business trips to make this money. When her husband died, he also left her with a lot of debt, a lot of doubt, and a background that terrified her. Shelby made a plan to pay off the millions in debt by selling everything and taking her daughter to her hometown in Tennessee. Her large family welcomed her home, along with a buff and gorgeous man, Griff, dead-set on helping her out, which includes in the protection department. Shelby’s husband’s past followed her along with murders in Little Rock. Griff would do his best to keep her alive and at his side. 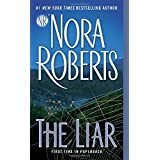 The close knit community in Tennessee, the charming people, and the far from charming people can only be created by Nora Roberts. If you’ve read her books, you’ll know what I mean. If not, it’s never too late to jump in and find another favorite author!